The Prehistoric Pile Dwellings around the Alps are the remains of prehistoric stilt houses at the edges of lakes and rivers. The site consists of 111 locations, spread out over 6 countries. They date from 5,000 to 500 BC, and represent the life of early agrarian communities in Europe. Rising water levels since prehistory led to the abandonment of settlements which were then covered by lake and river sediments. About 30 different cultural groups were responsible for creating these pile dwellings. I think these elusive Pile Dwellings secretly were the main goal for my December trip to Northern Italy. The Fiavè location seemed a sure bet to see “something”, and when I searched around for opening hours I found out that the Pile Dwelling museum in Fiavè opens up in winter too (2-6 p.m.). So I fitted this area into my full day itinerary around the Italian Alps, which lead me to no less than 3 new WHS. Fiavè is a town about half an hour south of Lake Molveno (with Dolomites view). It lies in a valley, and is nice enough in its own right because of the vernacular Alpine architecture. However I went straight for the Pile Dwelling Museum, located in the town center. The museum is new (or revamped because of the WHS designation?) - see the 2nd small picture for how it looks like. I had expected a small village museum with some pots and information panels. This is a modern museum however, with ample use of audiovisual presentations. 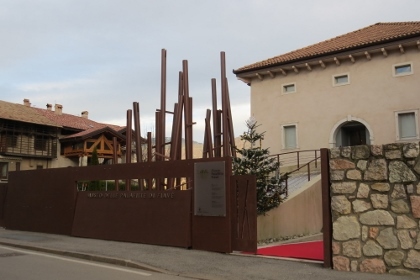 The exhibition focuses on the story of the pile dwellers around Fiavè (not the broader context), on how the archeological research developed, how the people lived etc. Quite a lot of objects belonging to the pile dwellers were found locally, such as baskets and hats weaven out of reed. Entrance fee is 3.5 EUR. The museum has friendly staff and is worth at least half an hour. Displays are both in Italian and English. What it does not provide is a direct link to the field with the remains. This lies 1 or 2 km outside of town, just across the road from the Hotel La Pineta. I parked my car at the hotel, as the entrance road to the piles is limited to visitors of a nearby trout farm. The road has a small sign directing to the archeological site too. The remains of the pile dwelling lie in a peat bog, and there’s a boardwalk around it with some explanations. 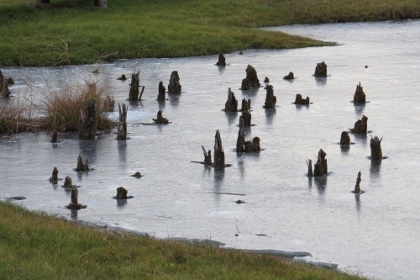 100 or so stumps stick out above the water level. A reconstruction of how the village looked like, with some stilt houses on the shore and others in the lake, can be seen in the museum. The visit is still a bit surreal (next to the pond locals were testing snow making machines), but not as weird I think as the Struve Geodetic Arc. I had attempted an earlier visit, in 2011. While I was staying in Neuchatel, I looked into visiting one of the locations around Lake Neuchatel. But all are hidden below water or sand. To get a taste of it, I went to the Laténium museum. This is a grand archeological museum with both outdoor and indoor expositions. It shows some reconstructions of pile dwellings - they look like wooden houses on stilts that are still common in other parts of the world. The history of these people occupies only one room in the museum. Much of the exhibits are reconstructions too, like clothing. There's not enough "on show" to really get a feeling about what this WHS represents (and I will not count it as a visited site). It left me with a little surprise fact at the end though: the pile dwellers ate dogs! 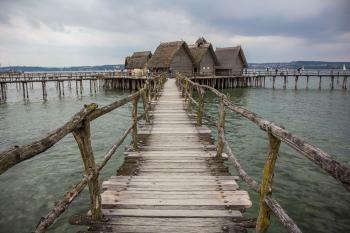 On the edge of Lake Constance, in the town of Unteruhldingen, experts have reconstructed a small community of these ancient pile dwellings. Although it is artificial in the sense that the structures are not original, everything has been put together exactly the way it would have been thousands of years ago. The museum is run by underwater archaeologists and cultural historians to ensure the accuracy of everything. What is particularly interesting is the way the huts are displayed these days as interconnected. Although the construction is quite rudimentary, there is an advanced sense of community in the design. The dwellings are built in clusters and are connected with elevated walkways. There is even a protective wall built in the water around one of the groups of buildings to create a small protected harbour. The museum has also incorporated exhibitions, displays and reconstructions within the dwellings to help illustrate the life of the original inhabitants. It is useful and informative but is a reminder that these structures are not strictly a historic site themselves, just representative of the ones that were once scattered all across this region and are now marked only by their underwater foundations. NS: "So on the map you printed out the WHS seems to be in the middle of those fields"
IC: "That must be it there, in those big agricultural looking sheds"
NS: "Maybe it is an archaeological dig"
IC: "Yeah it must be, perhaps we've accidentally hit the pile dwelling jackpot!" NS: "Hmm... my sodden shoes would suggest otherwise"
NS: "I must admit it feels a little creepy, really like we shouldn't be here." IC: "Is it the lack of signs and pathways, or in fact any tangible evidence of this not being a farm that make you think that." NS: "Well these buildings could we reveal wondrous secrets"
Our protagonists walk around large shed like structure. IC: "Well I don't think it is an archaeological dig." NS: "Is that...? Is that a beach hut?" IC: "Yep I think so, that would also explain the sand on the floor I guess." NS: "I think that was once a swimming pool"
NS: "Erm that sort of ditch in front of the beach hut." IC: "Have we stumbled into a derelict German rave?" NS: "This discarded hat behind the bar would indicate yes." IC: "And yep that must be the DJ booth." NS: "I now have more questions than answers. Was the rave themed on pile dwellings or are the pools and wooden huts just coincidental?" IC: "Why, considering all the farmland, did they hold it directly over the WHS? There aren't any roads"
NS: "Or paths, slightly baffling"
IC: "Well I have my souvenir, a rather mucky plastic beaker confirming that we are at the Archaeological remains of the Pestenacker Pool Party. Well I'm guessing that isn't it official name on the World Heritage List." NS: "... Anyway, time to head off for a celebratory pint?" IC: "Yep, onward, I know somewhere nice." Venice, Angkor, Yellowstone, Pasternacker prehistoric museum; hunting world heritage sites has taken me to some of the most spectacular places on earth, and also to Pestenacker prehistoric museum. It is an unfair comparison but they are all on the list together and I'm sure the local community at Pestenacker have immense pride in their world heritage certificate and so they should. The little museum (closed during our visit) is complemented by a slightly tired looking reconstruction of a pile dwelling. Next to this is a small stream which bisects the field under which the remains lay buried. There is precisely nothing of any note to see in the field, trust me we looked hard for any hint of rotten wood. So after 5 minutes we were heading off across the road to see the second site listed outside this Bavarian hamlet. One of the best places to experience this somewhat unusual site is the small German town of Unteruhldingen on Lake Constance, not far from Friedrichshafen and Konstanz. It features a well-known open-air museum with reconstructed pile dwellings and an interesting exhibition. Of course, the museum itself is not part of the WHs, but there is probably no other place where the mysterious, prehistoric world of pile dwellers is so graphically illustrated. And there is an actual WH location near the town's port, maybe a 5-minute walk from the museum. You can only see the plaque on the shore, as the pile dwellings are underwater and also covered by a canvas to protect them from damage caused by weather or boats. Still, it is good enough to tick off the site. Unteruhldingen is next to the famous flower island of Mainau, and can be easily reached by ferry from Meersburg. On a trip to Zurich, I checked out the 2 sites on Lake Zurich in the city centre, but couldn't find any sign. I also went to Rapperswil on the southern end of the lake and tried to find the sites there, but only found general signage, not specific pointers (but the area seemed perfect for pile dwellings, especially along the footbridge connecting the town with the island of Hurden). I visited this WHS in May 2014. I drove to Fiave’ in Trentino Alto Adige through mountain passes and winding roads. I was lucky to find perfect blue skies and sunny weather just a few days after snowfall, meaning that the mountain peaks were covered in snow. I was afraid that the pile dwelling remains were going to be underwater but this was not the case and I was very pleased. Set the GPS to the Hotel La Pineta which is just in front of the narrow unpaved road for pedestrians leading to the pile dwellings. The entrance is free and there are a few information boards give you a brief overview. 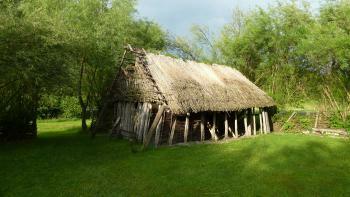 In the town of Fiave’ there is the Pile Dwelling Museum which is worth visiting if you have some time. 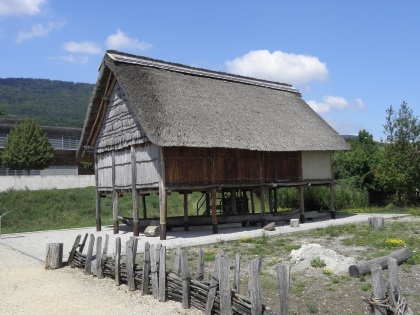 However, I very much prefer the Pfahlbaum Museum of Unteruhldigen near Lake Constance in Germany which is by far better and it also has replicas of pile dwellings next to the actual remains in Germany (now underwater!). Attersee: On the lakefront at Seewaldchen there is a mock-up of a pile dwelling with descriptive signs. 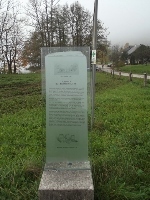 Opposite the railway station , beside the lake in Attersee village is a descriptive sign. At See am Mondsee there is a descriptive sign, and piles are visible beneath the water from the nearby bridge. I reached these sites by bus from Vocklabruck. 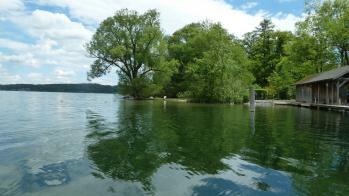 Keutschachersee: I found a descriptive sign at the eastern end of the lake, near the entrance to a recreation area. I caught a bus there from Klagenfurt. In the early days of the Forum on this Web site we had some discussions on what constituted “seeing” or “visiting” a WHS. Our trip to one of the Prehistoric Pile Dwellings provided a “reductio ad absurdam” example of the very concept of a “WHS Visit”! So hopefully we would gain a general view of the site and would surely find an explanatory board and a plaque indicating the site’s “world significance”! At this point it is perhaps worth placing “Blaustein-Ehrenstein” in context within the overall inscription. The AB evaluation indicates that there are 937 known “pit dwelling” sites across Europe - 156 of these were nominated but ICOMOS asked whether this could be reduced and 111 were inscribed . This reduction must have happened quite late on as the Nomination file still contains the full 156. However the Map section on the UNESCO site shows only those for the inscribed 111 - so do NOT use the Nomination File to determine whether a site is inscribed!! 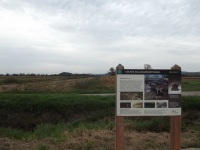 The documentation indicates that there are 3 types of site – Lacustrian, Bog and River Flood Plains. Blaustein is described as the “most northerly inscribed example” and is of the latter type. 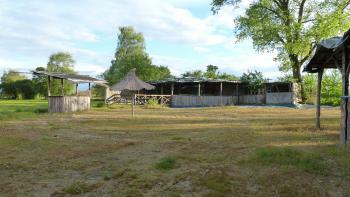 Its area is 1.33 ha making it the 6th smallest among the German sites. Its code (DE-BW-21) indicated that it was Baden-Wurtenburg’s 21st and last site (There are also 3 in Bavaria including Ian Cade’s Roseinsel) but 6 of these were sacrificed during the inscription process . Other facts garnered from the nomination file were - “Ehrenstein is among the best preserved wetland settlements in SW Germany. It plays a key role in our understanding of the key developments of the Schussenried culture. The research historical (sic) site has a high potential for future research”… It is Neolithic from 4000-3500BC … It was discovered in 1952 and the last archaeological activity (a trial trench) took place in 1999. ….it was “Repeatedly rebuilt, houses stood gable-end on with a narrow alleyway” …and was ”important for limestone jewellery discs” …. “The site is the only one related to the Schussenried culture on the list and represents a rare example of a pile dwelling in a river valley The site has a thick cultural layer containing at least 5 construction horizons with complete houses, fireplaces, ovens following each other within one century”….It was “Situated on what is probably an ancient pass route over the Swabian Alp to the settlements of the Michelberg culture on the middle Neckar” . 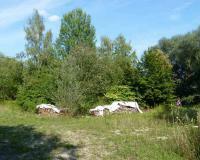 Interestingly the site at the type site of Schussenehied, which is also inscribed, doesn’t seem to provide a good example of a Schussenheid culture village but has been overlaid by later cultures – “Remains of the Pfyn-Altheim group occupation layers are present …. The Schussenhied culture village was probably similarly organized allowing conjectural mapping”. So, on the basis of the Nomination File, the site of Balustein-Ehrenstein had some special significance among all those nominated locations which presumably had justified it remaining among those which finally obtained WHS inscription! So I committed all this background detail and the Nomination File’s very detailed map of site to my iPod. In the middle of the map was a “confidence-building” green line surrounded by a red one representing the core and buffer zones respectively, situated just to the north of the B28 local road which I could find on my German road map! However, when we reached Blaustein, an immediate problem was that the area looked nothing like the photos or the map!! Indeed the Google satellite view as of Sept 2013 still shows a new road/bridge being built which wasn’t on the Nomination file map. Having allowed for this new road and using rivers and railway lines for guidance we eventually tracked down the site to a location just behind a “RAN Tankstelle” which faced the now completed new road! The open ground shown on the photos had beome heavily forested with new-growth trees and a berm had been raised around a part of the site – the rest of the area facing the road was fenced with a locked gate. Of signage or any acknowledgement that this piece of land was “UNESCO inscribed” there was nothing! I climbed the berm and made my way through the forest to arrive inside the fenced zone. Sure enough, as shown on my map, the river Blau cut its way diagonally across the site so I was definitely in the middle of the Core Area!! But all that could be seen were some piles of logs and a “road works” sign (photo) whilst, somewhere beneath my feet, lay the remains of a c6000 year old village! So, have we “visited” the Pile Dwellings site? Would my visit have been more “complete” if we had actually seen some bits of rotten wood? 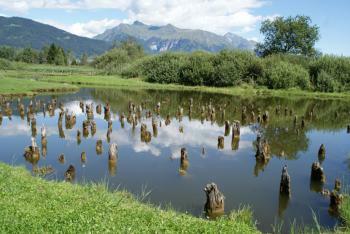 Would I understand more about the dwellings if I had seen the stumps in the water seen by Hubert Schnargel? Would the presence of a “reconstructed dwelling” have made the difference between having “seen” or having “not seen” the site? Would I be a “better”, more “complete” and knowledgeable person if I had seen any of this? Deconstruct the word “visit”! But let’s look at the positives! We successfully achieved the objective of tracking down DE-BW-21 to a nondescript copse in a nondescript valley in S Germany and entered the inscribed area – in effect “geocaching” it (without GPS!). We now know that there was never a lake where this village had been – indeed that a lake isn’t an essential aspect of these villages. Indeed it appears that, despite the inscribed title, it isn’t even necessary for there to have been “piles” for the dwellings. The Nomination file states “In the southern group of the Schussenried culture which followed (3955-3916BC) 2 house types are present. Real pile dwellings as found at Bad Buchau-bachweisen and a ground level house whose floor is made up of criss-crossing layers under a top of screed as for example at Ehrenstein”. Of course there is much more to “see” and learn about the Pile Dwellings than we achieved as a result of our “visit” to Ehrenstein – but merely to have seen a lake and some rotting wood would not alter that fact. The reality is that the Pile Dwellings site isn’t really a site for “visiting” in the normal meaning of that word but I am happy that I extracted some value from the trip and have a greater understanding of the inscription via “feet on the ground” and the investigation related to that visit both before and after. Part 1 of my visit to these pile Dwellings was a pleasant boat trip to Rosen Insel on Lake Starnberg. From the station at Possenhoffen it is a quiet 40 minute walk along the forested lake shore which to my surprise reacquainted me with a familiar friend from a few years back: The Pilgrimage Route to Santiago. I arrived at the pontoon just as another couple rang a bell which summoned over the boat from Rosen Insel. The short crossing gave the driver just enough time to tell us a little about the island and say the key words "UNESCO-Welterbe". A quick lap of the rose gardens led me to the vantage point where I stared intently at the water trying to spot the merest hint of some buried rotten wood. I think I may have seen some in the right place, but to be honest it may have just been any old bit of rotten wood. After a short look around the one room museum showing some finds I marched back to the pontoon, studiously avoiding the Royal Casino that everyone else was on the island to tour around and happy that I didn't have to explain I had taken 3 hour trip by train, boat and on foot just to not see some rotten wood. I walked back to the station, stopping off to have a glass of wine before catching a train to meet up with my friend to continue the next part of our Pile Dwelling adventure. I knew that finding the locations of the WHS pile dwellings in a featureless wilderness like the Ljubljana Marsh would be difficult on my own. As anticipated there was no signed directions. I was fortunate to meet a local naturalist who knew the marshland well, and who took me to Ig to visit two sites. I agree with Hubert that this site, like the German 'Limes' requires some imagination. I also managed to find two locations in Italy, one by Lake Costa near Monselice, and another by Lake Frassino near Pescheria del Garda. During a trip to the Dolomites, I took the opportunity to visit Molina di Ledro and Fiave. These sites are two of the rare places where original remains of the pile dwellings can be seen. In Molina di Ledro, at the shore of Lake Ledro, is a small museum and the reconstruction of a pile dwelling. From a footbridge you can see some piles in a small area near the shoreline. 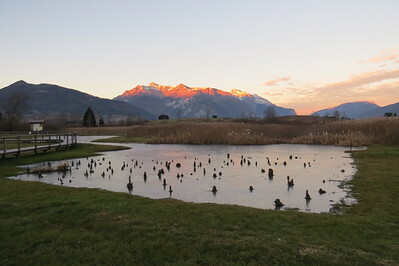 In Fiave, 35 km north of the Lake Ledro, is a small wetland with about 80-100 piles (photo). The site is one kilometre before Fiave on the left (coming from Lake Ledro). There is only a small signpost that can easily be overlooked. Both sites are located in a beautiful mountain landscape, but the remains themselves are not very impressive and do not tell much about what this WHS represents. At least, I have seen my first pile dwellings and have an idea how the original remains look like. To learn more about it, one has to rely on museums and replications. In this respect, it reminds me of my experience with the Limes, the German part of the Frontiers of the Roman Empire, where also only a few original remains are visible. Certainly, the pile dwellings are the oddest WHS that I've visited so far. I will not count the WHS as visited and I'm uncertain when I can tick it off. But my first visit made me curious to learn more about it.